The ProjectBabyName is a program that falls under the category of browser hijackers. It replaces your Google Chrome, Mozilla Firefox, Internet Explorer and MS Edge’s search engine by default, new tab page and home page and can redirect your browser to various unwanted web-pages. Of course, it’s not a malicious software or virus in the “general meaning” of this word. It will not delete or damage your files, but it can alter some system’s settings. So, you’d better to remove ProjectBabyName using the steps below and thus revert back your favorite startpage and search engine. In order to force you to use ProjectBabyName as often as possible this hijacker can modify your internet browsers’ search engine. You may even find that your personal computer’s web-browser shortcuts and Microsoft Windows HOSTS file are hijacked without your knowledge and conscious permission. The developers of this hijacker do so in order to make revenue via Google AdSense or another third-party ad network. Thus every your click on ads that placed on the ProjectBabyName generates money for them. It is likely that you might be worried with the hijacker responsible for changing your internet browser settings to ProjectBabyName. You should not disregard this undesired software. 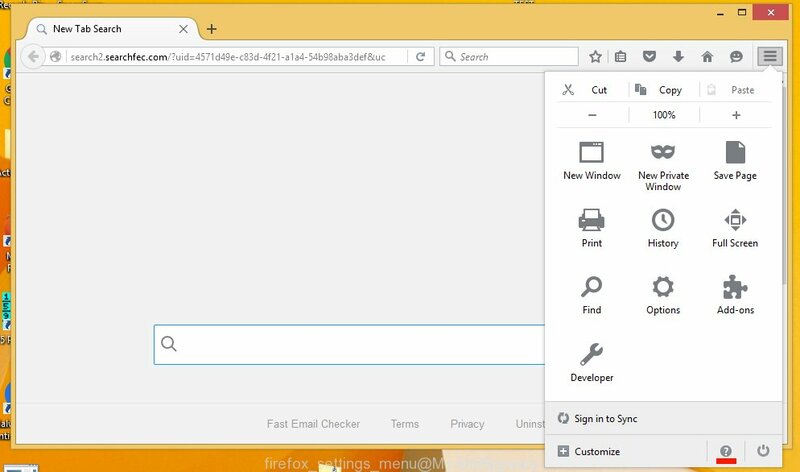 The browser hijacker might not only modify your start page or search provider, but redirect your web-browser to shady sites. What is more, the hijacker can analyze your surfing, and gain access to your privacy information and, afterwards, can sell it to third parties. Thus, there are more than enough reasons to remove ProjectBabyName from your web-browser. We strongly suggest you to complete the step-by-step tutorial which follow below. We’ll show you how to remove hijacker and thus delete ProjectBabyName search from your Internet Explorer, Edge, Firefox and Google Chrome forever. Fortunately, we’ve an effective method which will help you manually or/and automatically get rid of ProjectBabyName from your computer and bring your web-browser settings, including new tab, start page and default search engine, back to normal. Below you’ll find a removal steps with all the steps you may need to successfully remove this browser hijacker infection and its traces. Read this manual carefully, bookmark or print it, because you may need to exit your internet browser or reboot your PC. Do not know how your web-browser has been hijacked by ProjectBabyName hijacker? The following instructions is a step-by-step guide, which will help you manually delete ProjectBabyName from the Internet Explorer, Firefox, Google Chrome and Microsoft Edge. Some of potentially unwanted software, adware and hijacker infection can be removed using the Add/Remove programs tool that can be found in the Microsoft Windows Control Panel. So, if you are using any version of Microsoft Windows and you have noticed an unwanted program, then first try to delete it through Add/Remove programs. It will open a list of all programs installed on your machine. Scroll through the all list, and remove any questionable and unknown apps. To quickly find the latest installed programs, we recommend sort software by date in the Control panel. In order to restore all web-browser start page, new tab and default search provider you need to reset the Internet Explorer to the state, that was when the Microsoft Windows was installed on your computer. First, open the Microsoft Internet Explorer, then click ‘gear’ icon . It will display the Tools drop-down menu on the right part of the web-browser, then click the “Internet Options” as displayed in the following example. In the “Internet Options” screen, select the “Advanced” tab, then click the “Reset” button. The Internet Explorer will show the “Reset Internet Explorer settings” prompt. Further, click the “Delete personal settings” check box to select it. Next, press the “Reset” button as displayed in the following example. When the task is done, click “Close” button. Close the Microsoft Internet Explorer and restart your PC system for the changes to take effect. This step will help you to restore your web browser’s new tab page, default search engine and start page to default state. Reset Chrome settings is a easy way to delete the browser hijacker, harmful and ‘ad-supported’ extensions, as well as to restore the web browser’s newtab, search engine and start page that have been changed by ProjectBabyName browser hijacker. You will see the list of installed extensions. If the list has the plugin labeled with “Installed by enterprise policy” or “Installed by your administrator”, then complete the following tutorial: Remove Chrome extensions installed by enterprise policy. 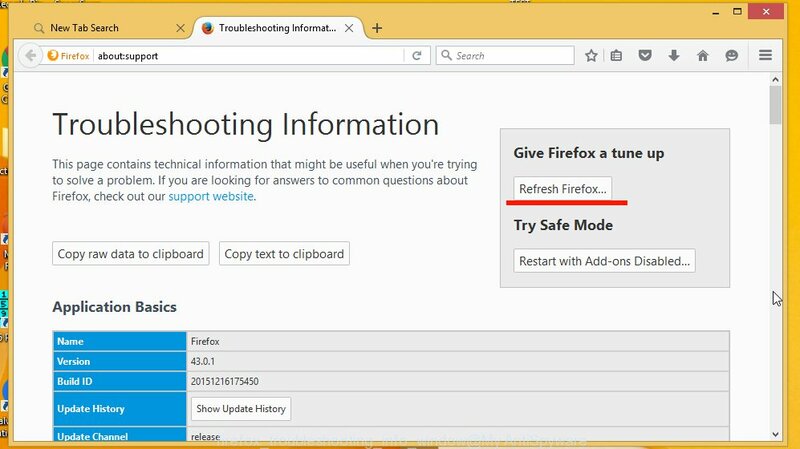 The Mozilla Firefox reset will get rid of unwanted search engine and start page like ProjectBabyName, modified preferences, extensions and security settings. Essential information like bookmarks, browsing history, passwords, cookies, auto-fill data and personal dictionaries will not be removed. The easiest solution to remove ProjectBabyName browser hijacker is to use an antimalware application capable of detecting browser hijacker infections including ProjectBabyName. We recommend try Zemana Anti Malware (ZAM) or another free malicious software remover that listed below. It has excellent detection rate when it comes to adware, browser hijacker infections and other PUPs. Zemana Free highly recommended, because it can search for security threats such ad supported software and hijacker infections that most ‘classic’ antivirus applications fail to pick up on. Moreover, if you have any ProjectBabyName browser hijacker removal problems which cannot be fixed by this utility automatically, then Zemana Anti-Malware (ZAM) provides 24X7 online assistance from the highly experienced support staff. Zemana can be downloaded from the following link. Save it on your MS Windows desktop. Once downloading is finished, run it and follow the prompts. Once installed, the Zemana will try to update itself and when this process is finished, press the “Scan” button to look for hijacker that responsible for browser reroute to the intrusive ProjectBabyName web page. This process can take some time, so please be patient. While the Zemana Free program is checking, you may see how many objects it has identified as threat. Review the report and then click “Next” button. The Zemana AntiMalware will remove hijacker responsible for redirections to ProjectBabyName and add threats to the Quarantine. Hitman Pro is a free utility that can identify browser hijacker that modifies internet browser settings to replace your newtab, homepage and search engine with ProjectBabyName web site. It’s not always easy to locate all the undesired programs that your PC system might have picked up on the Internet. Hitman Pro will detect the adware, browser hijacker infections and other malicious software you need to erase. Visit the page linked below to download the latest version of Hitman Pro for Windows. Save it on your Desktop. Once the downloading process is complete, double click the Hitman Pro icon. Once this utility is started, click “Next” button to perform a system scan for the browser hijacker which cause ProjectBabyName web-site to appear. A scan can take anywhere from 10 to 30 minutes, depending on the count of files on your computer and the speed of your system. When a threat is detected, the number of the security threats will change accordingly. As the scanning ends, you may check all items found on your personal computer. All detected threats will be marked. You can get rid of them all by simply click “Next” button. Now click the “Activate free license” button to start the free 30 days trial to delete all malicious software found. Delete ProjectBabyName hijacker manually is difficult and often the hijacker is not completely removed. Therefore, we recommend you to run the Malwarebytes Free which are completely clean your machine. Moreover, the free application will help you to remove malicious software, PUPs, toolbars and adware that your personal computer may be infected too. When the download is finished, run it and follow the prompts. Once installed, the MalwareBytes Free will try to update itself and when this task is finished, click the “Scan Now” button to perform a system scan with this tool for the hijacker infection which redirects your browser to unwanted ProjectBabyName web site. This task may take some time, so please be patient. When a threat is detected, the number of the security threats will change accordingly. Wait until the the checking is finished. Review the report and then click “Quarantine Selected” button. The MalwareBytes is a free program that you can use to remove all detected folders, files, services, registry entries and so on. To learn more about this malware removal utility, we recommend you to read and follow the few simple steps or the video guide below. One of the worst things is the fact that you cannot block all those undesired sites like ProjectBabyName using only built-in Windows capabilities. However, there is a program out that you can use to stop undesired web browser redirections, ads and pop-ups in any modern browsers including Firefox, MS Edge, Internet Explorer and Chrome. It’s named Adguard and it works very well. After downloading it, launch the downloaded file. You will see the “Setup Wizard” screen as shown below. Follow the prompts. Once the setup is finished, you will see a window as displayed on the screen below. You can press “Skip” to close the install application and use the default settings, or click “Get Started” button to see an quick tutorial which will help you get to know AdGuard better. In most cases, the default settings are enough and you don’t need to change anything. Each time, when you start your PC system, AdGuard will start automatically and block advertisements, ProjectBabyName redirect, as well as other harmful or misleading websites. For an overview of all the features of the program, or to change its settings you can simply double-click on the AdGuard icon, which is located on your desktop. It is very important to pay attention to additional checkboxes during the install of free software to avoid installing of PUPs, adware, hijacker infections or other undesired apps. Never set up the additional applications that the program wants to setup with it. Inattentive free applications download can result in installation of undesired program like this browser hijacker infection which cause ProjectBabyName webpage to appear. Once you’ve finished the few simple steps shown above, your PC should be free from hijacker infection that cause ProjectBabyName website to appear and other malicious software. The Microsoft Internet Explorer, Firefox, Edge and Chrome will no longer display unwanted ProjectBabyName webpage on startup. Unfortunately, if the few simple steps does not help you, then you have caught a new hijacker infection, and then the best way – ask for help here.